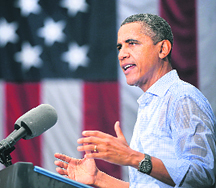 Noting that India prohibited foreign investment in too many sectors such as retail, US President Barack Obama today cited concerns over the deteriorating investment climate there to endorse another �wave� of economic reform. "In too many sectors, such as retail, India limits or prohibits foreign investment that is necessary to create jobs in both our countries, and which is necessary for India to continue to grow. 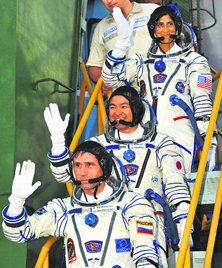 Indian-American record-setting astronaut Sunita Williams along with her two colleagues today took off for her second space odyssey on a Russian Soyuz rocket, which blasted off successfully from a cosmodrome in Kazakhstan. The vice-presidential elections took an interesting turn on Sunday with the Trinamool Congress� first choice for the post, Gopal Gandhi, refusing to take part, even as the Opposition-led NDA said its nominee could be decided as early as tomorrow. WORLD: Asma to be new Pak PM? SPORTS: Will India�s weight be over? UPA presidential candidate Pranab Mukherjee flew into Chandigarh from Srinagar on Sunday afternoon as part of his country-wide tour to seek support for the July 19 poll. Manohar Lal of Panchkula needs frequent protein plasma transfusions. His family used to buy plasma (Human Albumin), manufactured by Synergy Diagnostics, from the pharmacy of a private hospital for Rs 5,000 per 100 ml dose (MRP of Rs 6,030). At least 34 Indians were among the 39 pilgrims who were killed today when tragedy struck their overcrowded bus that skidded off a slippery road and plunged into a swollen canal in southern Nepal.